We are proud to announce the continuing availability of Williams Air Brake Products previously manufactured by Williams Controls, now made here in Portland, Oregon by BSI! 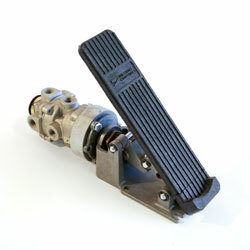 BRAKE SYSTEMS INC. is carrying on the tradition of Williams Controls quality. Recently purchased from Williams Controls, we own the dies, jigs and fixtures so we are able to control every step of the manufacturing and assembly. We have key engineers formerly with Williams now on staff to insure the continued quality of our products manufactured and assembled in Portland, Oregon USA. Air valves are 100% tested before leaving BSI. As a stocking manufacturer often we can ship same day. Non stock items have little lead time. For more information on our valves check out our air valves page! BSI's line of Air Cylinders is a continuation of the Williams cylinder line manufactured since the 1960's. Standard and custom models are available to suit your needs. We carry a wide range of Air Cylinders including: Engine Shut Down Cylinders, Single and Double Acting Cylinders, Feathering Cylinders, Modulating Cylinders and Indexing Cylinders.